When Cesidia Baugniet learned that her Belgian mother-in-law planned to pack a set of stainless steel platters in her luggage, she knew her chef-husband, Didier Baugniet, had a particular seafood dish in mind. Fifteen years later, that appetizer — steamed mussels with garlic butter and Parmesan — is a favorite at Scutra, the couple’s cozy restaurant in Arlington. “We can’t ever take it off the menu,” she says, describing how each bivalve rests in its own shallow indentation on the special plates. 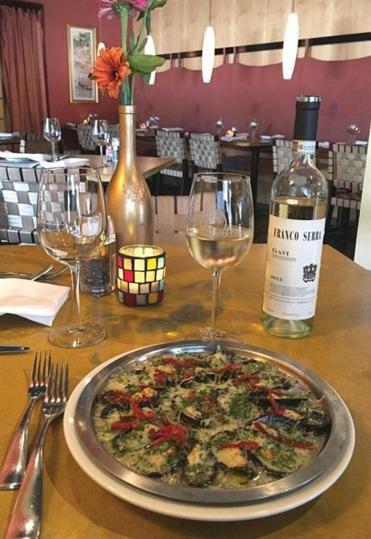 With the shellfish, Cesidia recommends a Piedmontese white, a 2015 Gavi from producer Franco Serra ($8 a glass, $31 a bottle), made from the cortese grape. “It’s crisp, light, and refreshing, with a bit of pear and floral,” she says of the versatile Italian pour. While enjoying the pairing, Scutra regulars love to hear how the chef’s mom hauled the dishes over the Atlantic for their dining pleasure.